Julia is just as dynamic as the vibrant pink smoothie she created. As a mother of 3, many come to her for motherly advice. And if she can get her kids to enjoy a beet smoothie, she’s worthy of seeking advice from. She enjoys eating fresh foods from CSAs, canning the fresh flavors of summer, and even has her own chickens in her back yard. When she’s not loving on her three kids she is working part time in astro physics. I’d say she’s pretty incredible! 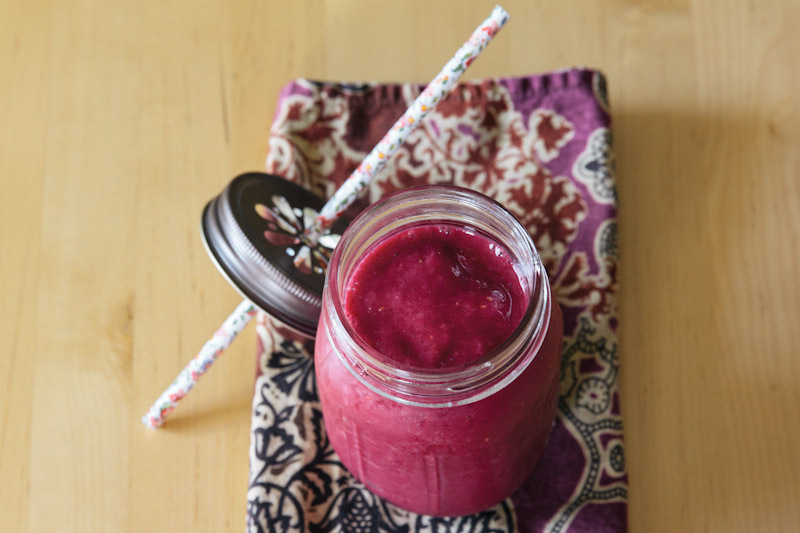 This bright pink smoothie is as delicious as it is beautiful. Peel beets and cut into large chunks. Toss everything into a blender and blend until smooth. More smoothie ideas from Julia: Carrot Peach Banana with Almond Milk, or Mango, Banana, Spinach with Almond Milk. Also, you can buy the cure jar lid and floral straw at We Love Citrus (a fabulous little with cute party decor and gift embellishments). Nice! Where did you get that neat little mason jar? I really like the lid. Thanks mom. The gal who made it actually is from Texas too! These sound delicious not to mention really healthy! 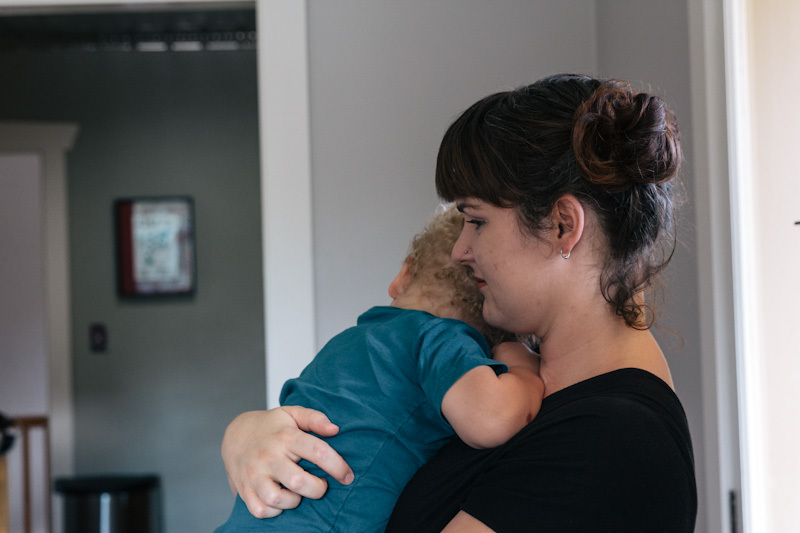 Perfect for any mom on the go. I don’t love beets but know how nutritious they are and would love to incorporate them more into my diet! I don’t think you can taste them too heavily in this smoothie- and you can’t beat that bright pink color to boost your day 🙂 Hope you are doing well Kelley!! Love the color of this smoothie. I don’t think I’ve ever had raw beets. They’re really sweet raw and if you shave or slice them thin enough I don’t think you need to cook them (they taste perfect!). I made a chocolate cake with raw beets this weekend!! Do you put the whole beet in the smoothy? Sounds delish!! Just slice off the skin and cut into cubes before blending! I’ll add that part into the recipe! Thanks for the note! I have canned beet on hand- could I use that?? The consistency might change a little but it should be okay. Make sure they are washed from any syrup or vinegar before you use them. Enjoy. Love the story and the recipe. Its a really nice pairing. Can you use cooked beets instead of raw? I think cooked beets will work fine! Let me know what you think! Just made this for breakfast using gold beets I roasted last night, and added some spinach – super delicious! 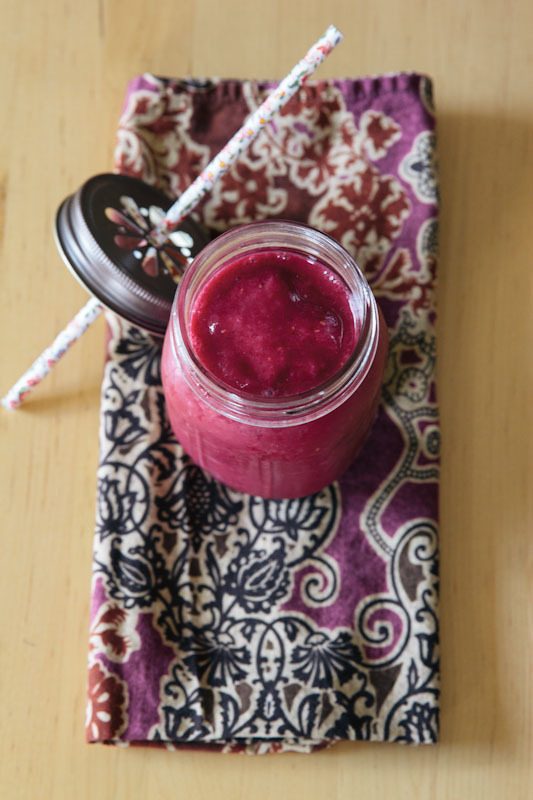 Was looking for a smoothie incorporating beets, so glad to find this recipe! Thanks! Crystal, sounds yummy! I’ll have to try using gold beets next time! Also, you don’t even have to cook the beets for this smoothie if you want to save time! It sounds so yummy! What if I don’t have almond milk? Can I use regular milk or water instead? Regular milk would be fine! You could also use yogurt. You may need to sweeten it a little since almond milk does add a little flavor. Enjoy! Did you an ordinary blender or one of those high powered ones? Have you ever added yogurt to this smoothie? Tiffany, I haven’t but I’m sure you could. If you use plain yogurt instead of the almond milk you may need a little sweetener. Taste as you go! Enjoy! Jan, I’ll have to try pineapple with this sometime soon! That sounds perfect! Thanks so much for reporting back. It’s great to hear someone else enjoying the same food! 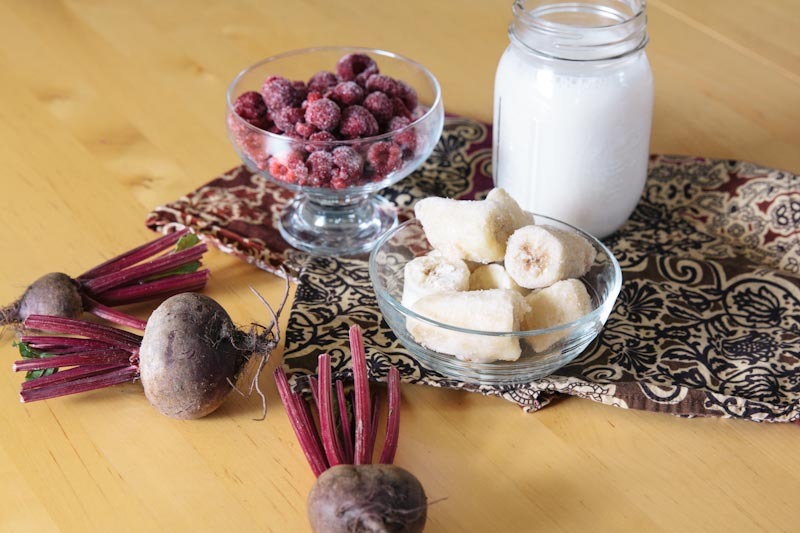 I absolutely love beet smoothies except I would not use rasberries as they are very seedy and gritty and does not blend well and does not taste smooth . I myself do ad pinapple, and strawberries and leaf from the beets and parsley. delicious! Kim, thanks for the tips! I’ll try a new version next time!